Every nation has its own recipe to make the wedding unforgettable, outstanding and special. How it happened that the wedding ceremony in all countries one but wedding traditions so variegate? Let’s make a small acquaintance with different cultures. The Indian wedding has rich wedding traditions and customs. Before the wedding days, the newlyweds’ families begin to treat everybody by sweetness’s, the groom and bride should exchange the rings. Pre-wedding ceremony in bride’s house is called “Mehndi”. During this ceremony, which can be called “Henna night”, hands and feet of the bride are decorated with elegant patterns from henna. During the wedding ceremony, the bride and groom put to one each other’s shoulders necklaces of flowers. This ritual shows that the bride accepted the groom as her husband. Which girl can say “No” to the groom who as like a prince on a white horse from fairy tales came to her and bring the miracle wedding? To make all these dreams come true needs the worthy groom, to identify the wedding budget and find the best professional organizer of weddings. Make your wedding unforgettable and grace it by traditions and customs of your region. But a courageous and decisive girl can go forward and make their wedding unique and fabulous by decorating the wedding by wedding traditions of other cultures. The wedding in Indian style is a perfect example of these kinds of marriage ceremonies. In the last years, the Indian wedding is getting more popular. And this is one of the reasons which progress wedding tourism in India. But in opposite to this rich Indians themselves prefer to celebrate their wedding abroad. Antalya (Turkey) is in great demand. Our professional organizers of wedding ceremonies in Antalya with great pleasure will help you to hold the wedding in Indian style. Traditional Indian wedding is beauty and brightness, most incredible decorations and fun, marvelous music and dance, flowers and delicious sweetness’s all these make the Indian wedding so popular. What the Indian wedding traditions which make the Indian wedding so attractive? Let’s dive into the world of fairy traditions, magic music, beautiful clothes, and fun! No one Indian wedding goes without these traditions. Indian wedding traditions have much common with other eastern countries’ customs. But Indian traditions are brighter and colorful. There are no white wedding dresses for a traditional Indian wedding. Colorful handmade bride’s clothes and decorations, jewelry make the Indian wedding so unique. Lehenga: Indian bride wears the traditional Indian wedding dress which called lehenga. Lehenga is a long, wide skirt. It pairs with a blouse which ends above a navel. The most widespread color of lehenga is red, but it can be pink, blue, orange, and violet, burgundy. The weight of this beautiful wedding clothes is decorated with stones, hand embroidery about 10 kg! It’s really too heavy, but which bride refuse such beauty in her wedding! Sharara: It is a dress of Muslim Indian and Pakistani women. A long dress covers all body. Sari (saree or shari): Female guests of wedding prefer to wear traditional Indian woman clothes, sari. Above a bodice and petticoat, they wind the six-meter-high sari. The wedding lasts on average 3 days and 3 nights. Before, the wedding day usually holds a ceremony Mehndi. The women come together in this ceremony. On this ceremony master of mehndi decorates bride’s hands and feet by henna. The guests decorate their hands too. This ritual embodies the bride’s happiness, her beauty and spiritual sincerity to her husband. The bride and guests enjoy all night, dance and sing. Traditional Indian weddings consist of a big number of different rituals. The Indian weddings distinguished by bright and fabulous dances. No can stay indifferent and do not join the dancing stream of men and women. People enjoy women’s dances, men’s dances, and common dances during all the wedding. 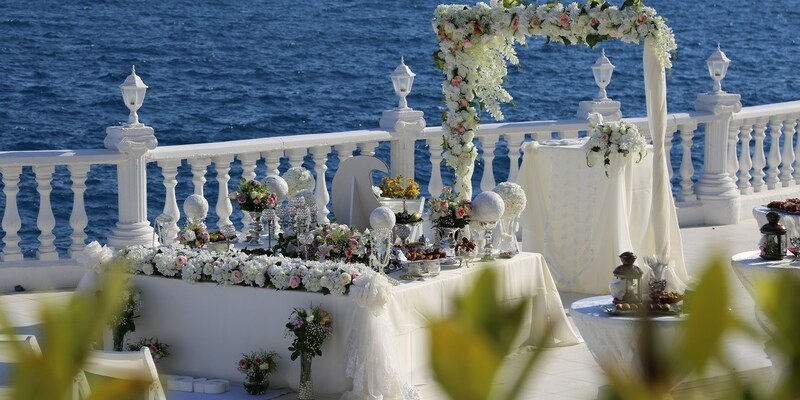 If you have the intention to make your wedding in Indian style on the beach of Mediterranean sea on picturesque places of Turkey, our international organizer of wedding Wedding City Antalya will help you to make your wedding unforgettable. According to Russian wedding traditions, the groom comes to the bride’s house to take her from her parents. The bride’s relatives hide the bride from the groom. To get the bride out the groom should go through some tests, to give answers to the relatives’ questions and pay something. The traditional payment, in this case, is a bottle of champagne, chocolate, money, and jewelry. This part of the wedding is passing in joking form. Pursuant to the traditions of Russian weddings, there is a wedding ceremony in the church. The newlyweds take the priest’s blessing. The wedding rings are wearing on ring fingers of right hand. The newlyweds are holding the candles during the wedding ceremony in the church. A prayer is recited. The groom and groom declare their consent and free will. They drink from the same glass by turn. The crowns are putting on their head. As in other cultures of the wedding, at Russian weddings the bride wears a special wedding gown It’s a long elegant dress. The white color in most cultures symbolizes the fidelity, pureness, innocence, and happiness. The groom wears an elegant wedding suit. Its color can be dark or light. After the religion rituals come time for the official ceremony in The Marriages Register Office. After the ceremony, they are expected by guests by the bread and salt on exit. The official ceremony can take half an hour. During the ceremony newlyweds put the signature in “The register of marriages” and the couple officially is declared as a wife and husband. After the official ceremony, their parents give the crystal glasses which the couple should break for happiness. The much pieces it will be broken the happier life of couple will be. After the official wedding ceremony relatives and guests are waiting the couple in the door to welcome them. They throw over the bride and groom petals and trifles as a symbol of a happy life and welfare. The couple sends the pigeons or balloons into the sky as a symbol of their love. The bride writes her maiden name on one of the balloons. When the official ceremony is over the newlyweds and their guests go down the streets in wedding cortege. They visit historical places of the city and goes to The Second World War Memorial known as Eternal fire. The newlyweds and guests have taken photos on the backgrounds of monuments and landscapes. There a lot of cities with bridges which called bridge of love. The couples who come on the bridge put a lock on certain places on the bridge as a symbol inviolability of their love and they throw the key of the lock in the river. The most interesting part of the wedding began in the wedding evening: delicious foods, entertainment, booze, dances, and games. There is a toastmaster on the wedding evening. The guests say toasts and congratulations, recite poetry, greet the couple, sing. After the first toast, the toastmaster invites everybody to drink the wine. After drinking the guests shout: “Bitter!”(“Gorko!”) that means that the newlyweds should stand up and kiss to make the wine sweet. It can be repeated several times until the guests will get satisfied. During the wedding dinner, the gifts to the newlyweds are declared. On the wedding day, the groom comes to the bride’s home to take her. The car of the bride is decorated with wedding decor. There is a new tradition which came up recently. The groom brings the bride to a special room with their relatives 10-15 person. The marriage officer comes too and registers the marriage. This small register of marriage is called Aghd. After this ceremony, the bride and groom can live separately (on year). Separate life lasts till the wedding day. On the wedding, place install the wedding table. This table called “Sofra Aghd”. It covered by a white tablecloth, on the table put some almonds, honey, nuts, candles, parsley, basil, mint, gherkins, green onion, mirror, flowers, sweetness, and Koran. In the wedding ceremony, the marriage officer asks the bride’s consent. But the bride doesn’t give the answer. Instead of this, someone says:” The bride is not here, she went out to gather flowers.” He asks again. They say the same thing. And only in third time, the bride’s parents give the answer. The same question he asks the groom. After his consent, the newlyweds put their signatures. The groom and bride should read some lines from the Koran. After they feed each other some honey to make their own life happy. Comes to turn to the jewelry gifts. All gifts are announced in front of the guests. The guests enjoy the ceremony, dance, take photos and have dinner. Traditionally the Japanese weddings perform in Shinto religion rituals. The bride should be colored in a white color which is a symbol of pureness and innocence and she dresses a white kimono. Her head covered with a white hood, which is a symbolically covers “ jealousy horns of the mother-in-law”. The couple should drink from one glass to show their unity. The bride during the wedding ceremony changes the dresses several times. At the beginning of the ceremony it’s kimono, but in the end, it’s can be a modern dress. All villagers take part in such weddings. Everybody takes part in the wedding preparations as well. In the wedding day, all villagers go out to streets to welcome the bride. The bride this day is marvelous looking. The Jamaican loves beauty, colorful and bright holiday. The groom also should get clothed in best clothes. For the wedding ceremony traditionally prepared several the wedding cakes. Usually, the ceremony goes in the groom’s house. His house is decorated with flowers and leaves of the coconut palm. The German families who have daughters plant trees. When the trees will have gotten grown up, they sell them to cover the wedding expenses. The friends of groom and bride and members of their families make the album with photos of newlyweds and sell them at the wedding. All obtained money goes to cover the wedding expenses. The German weddings performed in three stages. The first stage is a traditional wedding ceremony in the marriage register office. On the next day, there is the wedding dinner with friends and relatives. The third stage is religion ceremony. According to the Czech wedding traditions the bride’s girlfriends plant the tree behind the bride’s house. They decorate it with ribbons and colorful eggs’ shells. There is a belief that a bride’s life will as long as this tree’s life. Before the wedding on the newlywed's bed put the doll as a symbol of welfare and fertilities. During the wedding ceremony, women and girls sing traditional songs and dance around the bride. According to the Jewish traditions, the wedding ceremony is prohibited on the Saturdays and in religious holidays. The invitations are made in form of the traditional dance. The invitations are written in two languages, on English on one side and on Hebrew on other. The wedding ceremony performs under the tent which called “Chuppa”. There is a belief that Chuppa doesn't let the evil spirits come. The groom should break the vase wrapped in the cloth. This is a symbol of destroyed temple in Jerusalem. At the end of the wedding, the final prayer is read. Last three prayers include the main theme: the gladness, the bride and Jerusalem. After seven saint prayers, the groom and bride drink the wine by small throats and the wedding ceremony is over. The seven saint prayers are a very important moment in the marriage ceremony and traditionally it ends by the breaking the glass thing ritual. Sometimes this ritual performs after the engagement (erisin) and occasionally after the marriage ceremony (nisu’in). The glass is wrapped in cloth and the groom should break it by foot. The ceremony of the breaking the glass is symbolizing a grieve and sadness about the destroyed Temple In Jerusalem Ben-Hamikdash. The religion ritual of the wedding ceremony is over after the prayers. The wedding holiday lasts seven days. This is a special holiday to make the newlyweds happy. The relatives and friends prepare the great wedding dinner. The celebration is accompanied by songs, dances and reading the Torah. This celebration called “Sheva berahot” (Seven Blessings). According to the traditions, the couple doesn’t go to work until the one week is over. The next Shabbat after the wedding is called Shabbat Chatan ceremony. In this ceremony especially for the groom will be reading the Torah and pray for him. For traditional and themed weddings in Antalya please don’t hesitate, call our operators.